When I was first introduced into the world of vegan accessories, I never thought anything about the material used or how ethical it could be. Truth be told, I just followed all the other vegans and got into vegan leather. While I love Deux Lux, there’s just something about being able to feel good about using a material that was ethically sourced, recycled, and reused. 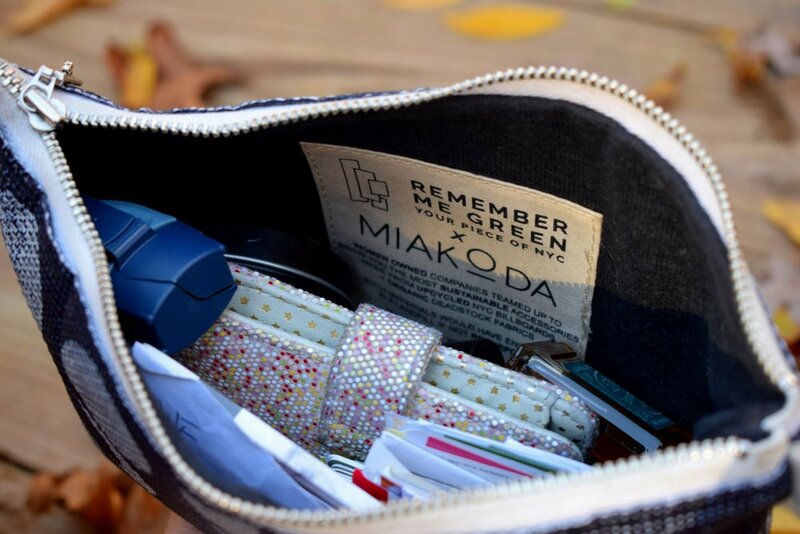 Now, I will admit the reason I know about Remember Me Green in the first place is because of Miakoda, and I don’t own anything else other than the wristlet, but when you know, YOU KNOW. Not only do I admire Jillian for coming up with this idea, I applaud her for executing it so flawlessly. When it comes to living an ethical lifestyle, it’s not at all easy, especially when you’re vegan. But more and more brands are popping up and making it so easy and attainable to be able to live this lifestyle. I’m thankful and grateful that I can even SHARE this with you guys, and that not only can you buy and support the brand, but you can become aware of how EVERYTHING we do, goes back to damage the planet and the animals. You have the choice and chance to change it all by supporting brands like this. Let’s learn all about Jillian’s thought process with Remember Me Green. No one would ever guess that your bags are made out of NYC billboards, how did this come to be? Billboard material is super durable since they hang outside for months at a time. I always wondered what happens to this material and when I found out it’s usually just thrown away, I knew there had to be a way to repurpose it. That’s how Remember Me Green came to be. 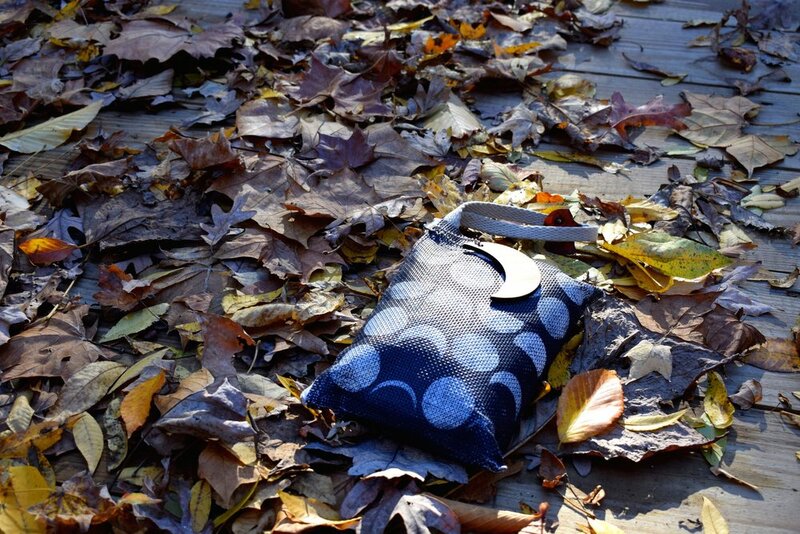 We are creating unique bags and saving the planet at the same time. With each piece being special and different than one another, has there ever been one that you wanted to keep because of that? Yes, I’m in love with a new one almost everyday! We never know what billboard we are going to get so we really have to open it to find out exactly what’s inside. It’s so much fun creating new one of a kind accessories with every billboard. With so many billboards and bags going in and out from your facility, and with each bag having it's own unique code, that allows the consumer to learn more about where their item came from, how do you keep track of it all? Each billboard is tagged when it comes to our facility. They are then cut into long strips and rolled up by color. We are pretty organized when it comes to that. As soon as one is done another one is opened and replaces it. With so many people going green, how do you think that has not only helped your business, but helped in regards to upcycling in general? We only have one planet and it’s great to see more people wanting to do their part. Promoting eco friendly products really spreads the word. With that said, what are some fashion bloggers you wish would incorporate more green items in their wardrobe? If people are just starting with going green with their wardrobe, where do you recommend people start, whether it be brands or publications to learn more? Instagram is a great way to find eco bloggers and influencers easily who share their favorite sustainable and green brands. There’s so much information on instagram, I find new environmental information and eco brands all time while scrolling. You've been around for years, even before being 'green' became a thing. What is the hardest lesson you learned that impacted you or your brand? It doesn’t happen overnight. I thought when I first started that all I have to do is make a website and put up product and people are going to love it, feel passionate about your mission, and buy it. It takes a lot of patience and hard work to get your product out there, and a lot of patience to educate about buying eco friendly products. What are some of your favorite ways to be green and sustainable in your personal life? Reuse and recycle whenever possible. I always say no to single use plastics. I’m always bringing my own utensils and cups when i’m out. And of course I bring my Remember Me Green bags to go shopping with. 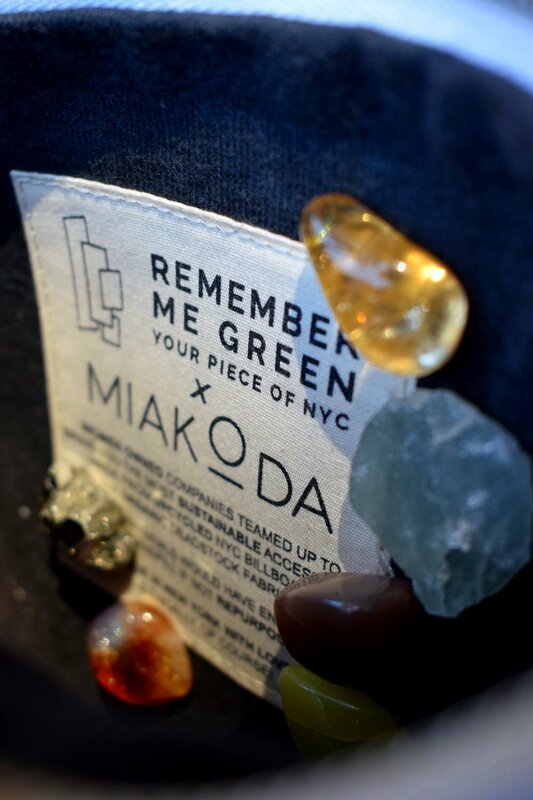 I shop eco friendly clothing brands like Miakoda. Even my phone case was made from recycled plastic straws. If every person did a little bit, we’d be much further ahead. How did the Miakoda X RMG collaboration come to be? What was your favorite part of working with Julia? Julia is the best! We met about 5 years ago at The Green Festival in New York City which is an event that showcases green products and services, and where people go to learn how to live healthier, more sustainable lives. We clicked right away and have been great friends ever since. We are very like-minded and both run eco friendly brands it only felt natural to create something together. Last year we started our moon collaboration, which has been so successful that we add to the collection all the time. Before RMG, what did you envision you'd be doing with your career? I have a degree in Business Management. Right after I graduated I worked in Retail Management. I always loved fashion. I’m glad it worked out the way it did. What is one of your guilty pleasures when it comes to food? Ice cream! I love every flavor of So Delicious Cashew Milk ice cream. Lastly, what is one thing people would never guess about you? As you can see here, the wristlet holds everything that’s important. My wallet from Deux Lux, my inhaler, some coupons, a love note from Chris and a bunch of lip balms and crystals. I literally use this EVERY DAY and it has seen better days. It’s still in great quality and honestly, I don’t want anything else ever. I do want to eventually get another one, maybe an actual bag, but I’m just so addicted to how handy this is. What are your thoughts on using recycled billboards for wallets? What’s your favorite piece?